zeitAnker Annotation Transcriber: Reduce to the max. 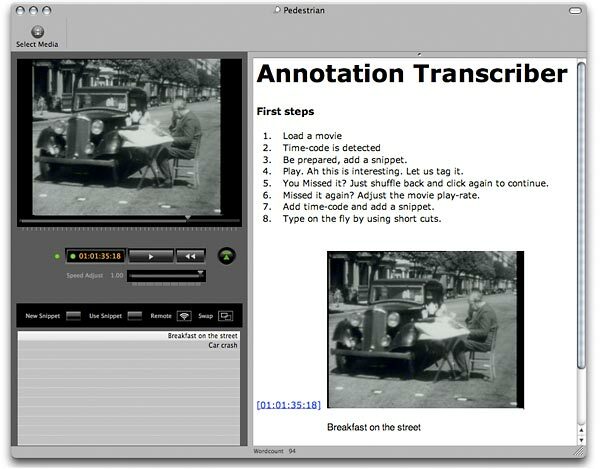 This new tool gives transcribers everything needed to write, set timecode-markers, adjust playback speed, replay and add snippets. Features include foot-pedal support and shortcuts for fluent work. Use any video and audio file that QuickTime supports. You can add video-images at fixed and variable scale with drag and drop or create multi-column storyboards. The editing features give you all you expect from a native Mac OS X application. Export to layout applications or to time-code savvy applications like Annotation Edit or Final Cut Pro, print or email files as PDF. Files may be sent to and edited by other applications, without loosing active time-code markers to directly jump to the scene. 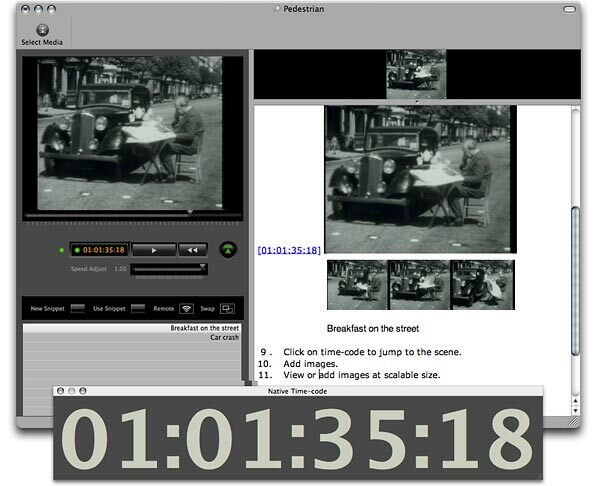 Video producers will appreciate Annotation Transcriber's abiltity to read, use and display native time-code (NTSC DF, Pal NDF). The often missed "big" time-code display is right at your hands. Simple and fast spotting using Apple Remote Control. Your work in Annotation Edit can be imported for further refinement simply by using RTF. More info as PDF download here. Free for registered customers of Annotation Edit..
Requrements: Mac OS X 10.4.5 (Tiger) PPC/INTEL universal binary. The introductory price for Annotation Transcriber is only 29 €. This price is a time-limited offer. Click to read the SoftPedia editor's review for Annotation Transcriber.